Oh how we have missed good egg noodles for our soups. These were crazy easy and super good! I DID IT! I MADE NOODLES! Ever since I was a young adult and started cooking on my own I have been afraid of making fresh noodles. Now that I have made them I don’t know why I was so scared. I have a very vivid memory in college, going to my friend Cynthia’s house to hang out for a bit. Her mom (whom I have loved and admired for years) was making chicken noodle soup for dinner. No biggy right, but the kicker is that she was making her own noodles. I was like really????!!!! She explained that they are so easy to make and saves her tons of money every time. She continued saying that all of their noodles are homemade. Then for a while I lived in upstate NY, I was serving a mission for the LDS church. We had diner many times with a fabulous family (I can still see them all in my mind and I have such fond memories of this family). One night the mom was making us dinner and she was making fresh homemade noodles. Again I was like REALLY?!?!? People do that?!??! The noodles were so good and fresh. I always thought making your own would be hard and arduous, and why – when you can buy your own. Now that we are gluten free (4 years now) and we have not had egg noodles in a while, I had given up hope of ever having chicken noodle soup (unless I wanted to pay a large fortune for special GF egg noodles). And I was starting to crave noodles that are not easily found, like egg noodles and fettuccine, its easy to find certain types of noodles, but I want more then spaghetti. Well all these years later I have been proven wrong and I will make our own FRESH noodles many times in the future. It really was no biggy, super easy and so good! They were a big hit with the kids too. I did have one negative comment from 1 of the 4 children (I consider that a success!) the comment didn’t pertain to the taste or texture, but to the thickness. Little Engineer said they were “a bit thick.” So next time I will just roll them out thinner, or better yet since Christmas is coming I bet I can get my mother-in-law to buy me the noodle press attachment for my Kitchen-Aid. I did plenty of research about which recipe to use for the GF egg noodles, I settled on this one because I didn’t have to buy extra flour types or blends, I just used the one I had. I love Grandpa’s Kitchen Flour. It works for everything I make. It is smooth and has a fabulous taste and texture. I got the recipe from Iowagirleats. The link also includes her chicken noodle soup, which we also ate for dinner. It was thick and more like stew, but we loved it! I did need to alter it a bit, since it was flakier then I thought it should be. So I added one more egg yolk and 2 more TB of water. Mix it all together with your hand mixer then kneed it a few times on a floured surface, until a nice round ball forms. 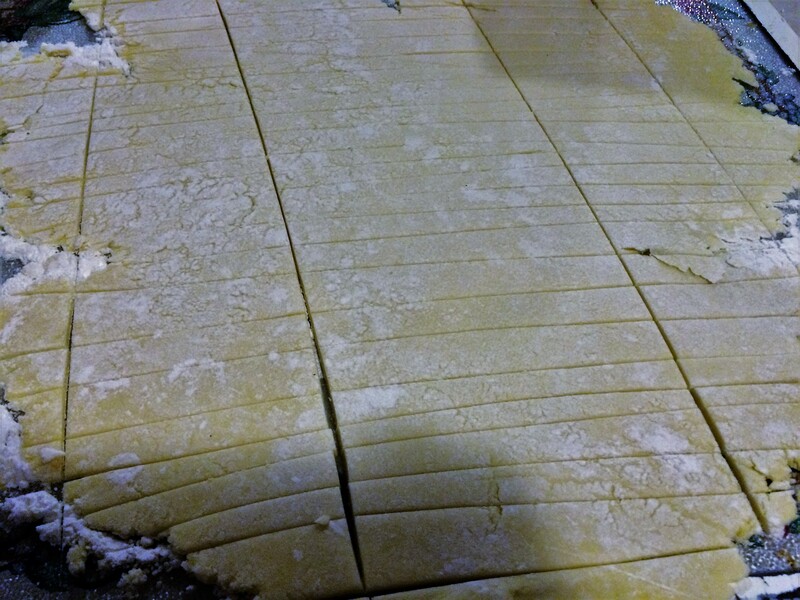 Then dust your rolling surface, (just like with sugar cookies). Roll it out flat and thin. You will need to dust the top of the dough as you roll it out too. Cut it into strips with your pizza cutter. Add the uncooked noodles to your soup and let them cook for about 13 minutes in the hot water. Careful not to let your soup burn on the bottom while you get the water to boiling. Stir occasionally so it doesn’t burn! Serious, ours burned. Iowagirleats even warned us of that, and we still burned it. Her chicken noodle soup recipe is on the same link and it was so good. The only difference is that I didn’t have any chicken legs, but I did have freshly canned chicken (I canned it two weeks ago) so I used that. 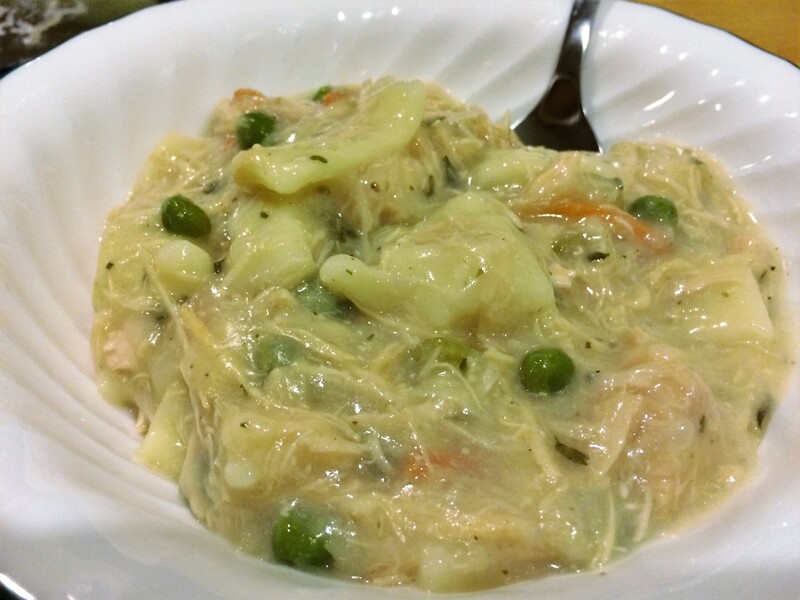 More like a chicken stew, and soooooo very good and filling. We will certainly make this again, I give it a 5 star. Easy and good noodles, excellent soup. This entry was posted in Gluten Free Recipes and tagged GF Chicken noodle soup, Gluen Freen Egg Noodles. Bookmark the permalink.